The fortified city center of Gallipoli at the blue hour with the lights of the city reflected in the mediterranean sea. 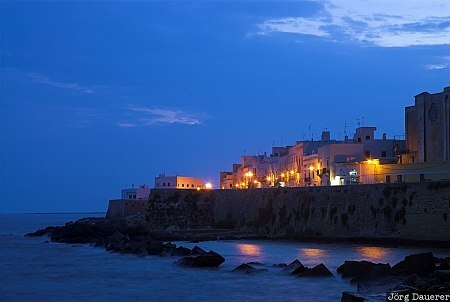 Gallipoli is located at the west coast of the Salento peninsula in the province of Lecce, Apulia (Puglia), Italy. This photo was taken in the evening of a sunny day in April of 2006. This photo was taken with a digital camera.